Fracture risk assessment tool (FRAX) and for the diagnosis of osteoporosis in Japanese middle-aged and elderly women: Chiba bone survey. Ide S, Finer G, Maezawa Y, Onay T, Souma T, Scott R, Ide K, Akimoto Y, Li C, Ye M, Zhao X, Baba Y, Minamizuka T, Jin J, Takemoto M, Yokote K, Quaggin SE. Transcription Factor 21 Is Required for Branching Morphogenesis and Regulates the Gdnf-Axis in Kidney Development. J Am Soc Nephrol. 2018 Dec;29(12):2795-2808. 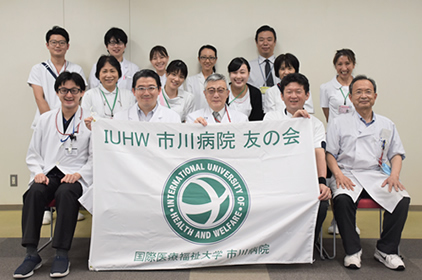 Maezawa Y, Kato H, Takemoto M, Watanabe A, Koshizaka M, Ishikawa T,Sargolzaeiaval F, Kuzuya M, Wakabayashi H, Kusaka T, Yokote K, Oshima J.
Biallelic WRN Mutations in Newly Identified Japanese Werner Syndrome Patients.Mol Syndromol. 2018 Jul;9(4):214-218. Matsuda H, Matsuda M, Koshizaka M, Matsuda Y, Sakamoto K, Yokote K, Matsuda Y,Takemoto M. Evaluation of a high serum docosahexaenoic acid level as a predictor of longevity among elderly residents at a special nursing home. Geriatr Gerontol Int. 2018 Jun;18(6):980-982. Watanabe K, Hirano S, Kojima K, Nagashima K, Mukai H, Sato T, Takemoto M, Matsumoto K, Iimori T, Isose S, Omori S, Shibuya K, Sekiguchi Y, Beppu M, Amino H, Suichi T, Yokote K, Uno T, Kuwabara S, Misawa S. Altered cerebral blood flow in the anterior cingulate cortex is associated with neuropathic pain. J Neurol Neurosurg Psychiatry. 2018 Oct;89(10):1082-1087. Ide K, Koshizaka M, Tokuyama H, Tokuyama T, Ishikawa T, Maezawa Y, Takemoto M, Yokote K. N-3 polyunsaturated fatty acids improve lipoprotein particle size and concentration in Japanese patients with type 2 diabetes and hypertriglyceridemia: a pilot study. Lipids Health Dis. 2018 Mar 15;17(1):51. Nakagami H, Sugimoto K, Ishikawa T, Fujimoto T, Yamaoka T, Hayashi M, Kiyohara E, Ando H, Terabe Y, Takami Y, Yamamoto K, Takeya Y, Takemoto M, Koshizaka M, Ebihara T, Nakamura A, Nishikawa M, Yao XJ, Hanaoka H, Katayama I, Yokote K, Rakugi H. Physician-initiated clinical study of limb ulcers treated with a functional peptide, SR-0379: from discovery to a randomized, double-blind, placebo-controlled trial. NPJ Aging Mech Dis. 2018 Feb 13;4:2. Shoji M, Takemoto M, Kobayashi K, Shoji T, Mori S, Sagara JI, Kurosawa H, Hirayama Y, Sakamoto K, Ishikawa T, Koshizaka M, Maezawa Y, Yokote K. Serum podocalyxin levels correlate with carotid intima media thickness, implicating its role as a novel biomarker for atherosclerosis. Sci Rep. 2018 Jan 10;8(1):245.